SEVNICA, Slovenia — Janez Levstik offers a bright smile and a firm handshake when he greets visitors at the information center in the heart of Sevnica, a hamlet of 5,000 in southeastern Slovenia. 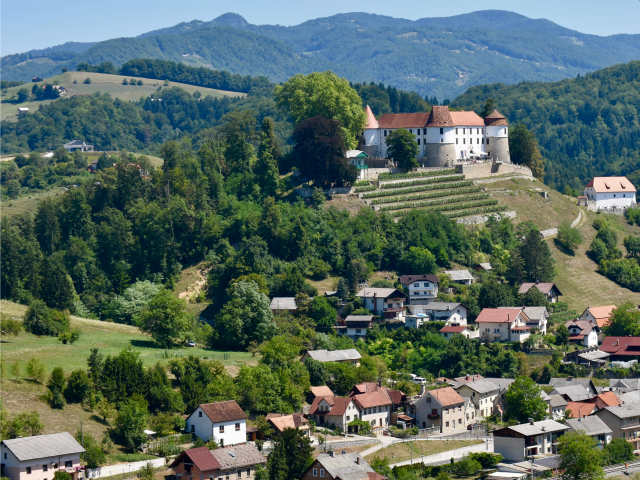 The tours he leads these days, however, aren’t to the medieval castle (Gard Sevnica) or to hilltops with views of the picturesque River Sava that runs through the heart of town. Now tourists come from near and far — including the United States of America — to join the “First Lady tour,” a two-hour walking trip that winds through the streets to visit shops that carry White House slippers and Prva Dama (First Lady) apple pie. Just steps away from the information center is the elementary school that Melania attended. The school, like much of the town around it, reflects the history that dates back to medieval and even darker times. The school is named for Savo Kladnik, a young man who fought against the more than four-year German Nazi occupation of the former Yugoslavia. “He was put in a concentration camp and then he was shot,” Levstik said. A bronze statue of the young man, described by countrymen as a hero and patriot who died at 20 years of age, sits near the entryway of the school. Another memorial is near the train station. It lists the names of other men who died fighting for freedom before the 10-day war for Slovenian independence in 1991. Another stop on the tour is a bakery where miniature pies made from local apples are sold. They’re decorated with an American flag and a crust emblazoned with an “M” for Melania. When Melania was a child she lived in the apartments not far from the bakery that were built during socialist and communist rule in Sevnica. Today, the building is painted a bright orange with blue trim, in sharp contrast to the required gray or white paint required by a government that wanted “equality” for all people. The apartment where Melania Trump lived as a child is not far from a shoe factory that designed White House slippers in her honor. Colorful homes dot the landscape in Sevnica today, a tribute to a now free people. Down the road from the apartment is a factory that started manufacturing wooden shoe molds in 1886. It’s now known for its quality women’s shoes, including “White House” slippers inspired by Melania, which sell for about 50 U.S. dollars. A saleswoman at the Kopitarna shoe shop holds up a pair of White House slippers, designed to honor First Lady Melania Trump. Levstik points to an old photograph on the wall of the shoe shop that shows a factory in the middle of the woods — now on the edge of a town bustling with shops selling all kinds of goods from around the world — inventory once banned by Communist leader Josip Broz Tito, who forbid any forms of capitalism in the country. Melania’s parents, Viktor and Amalija Knavs, moved from the apartment years ago to a stately home in a nearby neighborhood. Levstik said Viktor visited for a couple weeks a few months ago, but the couple, who still own the home, spend most of their time in the United States. “They are great people,” Levstik said. At another bakery called Julija, ‘“Torta Melanija” cake is sold, a delicious and rich cake with a frosty white topping. “White chocolate for the White House,” Levstik said of the creamy slice of white chocolate atop each piece. The factory where Melanie’s mother used to work making children’s clothing — and where Melania got her first taste of modeling as a very young girl — isn’t on the walking route. But Levstik gave this reporter a lift to the site, located on the other side of the river. Today, the factory makes plastics and is expanding, Levstik pointed out, as construction workers using cranes and other equipment filled the roadways around it. Another restaurant on the main street in Sevnica pays tribute to the husband of its most famous former resident. Rondo’s menu features a “presidential” and a “top sh—t” burger. No one will reveal the recipe, but it’s popular, locals said. Back at the information center, visitors can buy a range of Melania souvenirs, including a First Lady wine made from local grapes, First Lady chocolates, and a First Lady beauty cream. There’s also a First Lady sausage on sale, but don’t expect to buy it at Salamiada, the annual sausage festival the town holds every March. What do the women do on that day, Breitbart asked a local woman. “Have peace at home,” she said. I was rather surprised the President and First Lady did not make a side trip to Sevnica when he visited Poland. Their reception would have been clamorous outdoing even the French who went berserk when JFK and Jackie visited them in 1961. A famous line from that visit was when Jack made a speech and said, "Remember me? I'm the fellow who accompanied Jackie here." That was close to whatever he actually said.